On Saturday morning, 500,000 Toledo, Ohio, residents woke to an urgent warning that their tap water could make them very, very sick. Toledo’s water crisis is over, for now, but the “perfect storm” that created it rages on. Mayor D. Michael Collins lifted the tap water ban on Monday, but that doesn’t mean Toledo residents — or the other 11 million Americans who get their drinking water from Lake Erie, or the 25 million who live near the Great Lakes — can rest easy. The factors that caused the crisis remain unaddressed. Why couldn’t Toledo residents trust their tap water? The culprit is a toxin called microcystin, released by cyanobacteria, also known as blue-green algae. Microcystin is pretty nasty stuff. It causes stomach pain, nausea, vomiting, severe headaches, and fever if ingested. It can cause severe liver damage. It causes rashes, hives, and blisters on the skin. It’s been known to kill dogs and other animals. Boiling water doesn’t kill microcystin. It just concentrates the toxin. Blue-green algae has been around for 3.5 billion years. Why is it suddenly a problem? Actually, there’s nothing sudden about it. Toxic blue-green algae has been a growing problem for 10 years. The algal bloom troubling Toledo isn’t even very big. 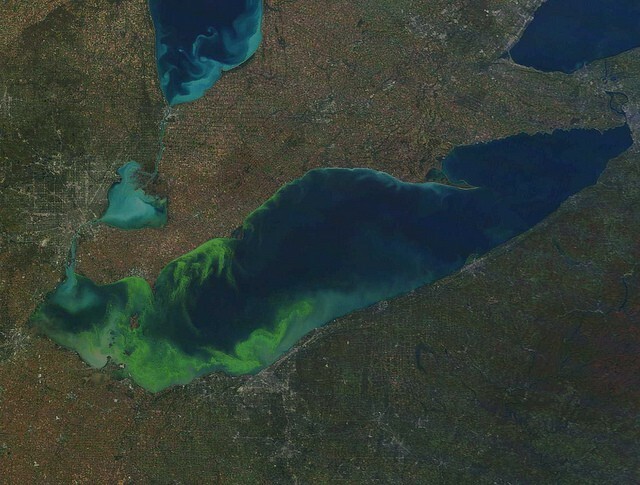 The National Oceanic and Atmospheric Administration has released satellite images of algae blooms on Lake Erie that have stretched all the way from Toledo to Cleveland, and beyond. MODIS satellite image of Lake Erie, 10/9/11 showing algae bloom Credit: NOAA. CoastWatch. Pollution, conservatism, corporate lobbying and climate change created a “perfect storm” for the algae that poisoned Toledo’s water. Pollution: Like the classic horror movie mutants of the 1970s, the big green monster that poisoned Toledo’s water is a product of pollution. Scientists blame an overload of phosphorus, caused by runoff from agricultural pollution. Farming operations have grown, along with the use of manure and new chemical fertilizers containing water-soluble phosphorus. A rise in no-till farming leaves more fertilizer on top of untilled soil, where it can easily run off into Lake Erie and other Great Lakes. About 63 percent of Erie’s watershed is used for agriculture. An Ohio state government task force found that Erie received more phosphorus than any of the Great Lakes — 44 percent of the total for all the Great Lakes. Two-thirds of that phosphorus came from farmland. Conservatism: In the 1960s, Lake Erie was so polluted with industrial waste and sewage runoff that it was considered “dead.” Local officials were embarrassed into cleaning up their act, Congress passed the Clean Water Act in 1972, and by the late 1990s Lake Erie showed signs of returning to health. Current problems underscore the Clean Water Act’s limitations. The Act was designed to regulate pollution from fixed points, like industrial outflows and sewer pipes. Today’s agricultural pollution is spread out over thousands of miles. Addressing the agricultural pollution the Clean Water Act doesn’t cover has fallen to the states. On the federal level, conservatives have limited the government’s ability to regulate agricultural pollution. The Supreme Court, in a 5-4 conservative-liberal split with Justice Anthony Kennedy joining the conservative bloc, questioned the scope of the Clean Water Act. In a 2006 ruling, the Court limited regulators’ ability to protect wetlands — which filter out phosphorus before it reaches lakes — and other waterways not directly connected to streams covered by the Act. Since then, Republicans in Congress have blocked an effort to expand the Clean Water Act’s authority, claiming it infringes on private property rights and threatens farmers. Republican-led state and local governments have done little or nothing to regulate agricultural pollution. Ohio Gov. John Kasich signed legislation to certify farmers who use phosphorus fertilizers. The voluntary program doesn’t start until 2017, and stops far short of mandating restrictions on phosphorus fertilizers. Corporate Lobbying: Corporate money is now an invasive species in our politics. Agriculture and fertilizer are big businesses, involving big profits. Some those profits are spent on lobbying against federal legislation and on campaign contributions to lawmakers who can be counted on to oppose federal regulate of the industry. Monsanto, one of the largest fertilizer manufacturers, has spent $6,940,000 in this election cycle on lobbying, and $542,218 on contributions. Koch Industries, which includes Koch Fertilizer, has spent $10,430,000 on lobbying, and $2,217,643 in campaign contributions. Monsanto is a major client of the Fertilizer Institute, the lobbying arm of the fertilizer industry and agricultural interests that oppose efforts to restore some of the Clean Water Act’s authority. The industry has also fought against limits on fertilizers on the state level, including lawn fertilizers in Florida and overall pollution in the Chesapeake Bay. In Missouri, the agriculture and fertilizer lobby is advocating a “right to farm” initiative that serve as a legal tool for states to block new regulations. Climate Change: Conservatives often say it doesn’t exist, but climate change is an important factor. Longer, hotter summers combine with phosphorus levels to create ideal conditions for algae growth. Increased water temperatures cause more blooms to grow and help them last longer. Climate change is predicted to increase rainfall. The Midwest has seen a 37 percent increase in rainfall since the 1950s. Heavy rainfall is expected to increase along Lake Erie’s shores in the next century, becoming four to five times more common by 2100. That means more phosphorus pouring into the lake. The storms stir up the water, bringing more algae to the surface, and moving it around. The bloom that troubled Toledo wasn’t one of the biggest, but winds and waves pushed it closer to shore and right into water system intakes, instead of pushing it to the middle of the lake. Invasive Species: This is good news for zebra and quagga mussels, two invasive species that were introduced into North America in the late 1980s, when they were picked up in the ballast water of ocean-going ships and introduced into the Great Lakes. They’ve spread to 29 states by hitching rides on riverboats moving between the Great Lakes. Both zebra and quagga mussels dine on algae, but neither can digest microcystin. So they expel the toxin, thus increasing its concentration. Toxic tap water will continue to plague Toledo and other cities until we revive the kind of clean water rules that brought Lake Erie back from the brink before. In 2009, the Environmental Protection Agency joined state water authorities in issuing “An Urgent Call To Action,” to reduce phosphorus levels in Lake Erie. So far little action has been taken. At the Monday press conference announcing the end of Toledo’s tap water ban, Mayor Collins drank a glass of tap water to emphasize its safety. It made for nice optics, but until our elected official place a higher priority on public health and safety than satisfying corporate donors, we Americans can’t even trust the tap water in our own homes.